Bracken (Pteridium aquilinum) dominant site over neutral grassland under storey (Grid ref. SN780 743) Situated at ADAS Pwllpeiran mid-Ceredigion. 300 metres above sea level. Aprox. 23km east of Aberystwyth, 2km north east of ADAS Pwllpeiran. This is not a NATURA 2000 site however it is situated approx. 900 metres from the Elenydd Natura 2000 site. (see map). 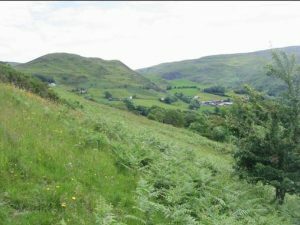 The removal of large grazing animals from the Welsh uplands has allowed Bracken to invade large tracts of land severely reducing biodiversity and productivity.